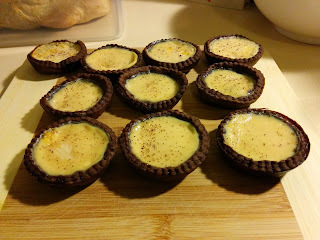 My daughter requested custard tarts to celebrate the end of the school year. Oh, OK, twist my arm :) I varied the recipe from last time by making a chocolate crust instead of the plain (though sweet) one. I actually made two batches, refining the recipe the second time. The first effort used muffin tins (making 12 tarts) which meant lower sides on the tarts (my largest pastry cutter is 9.5cm) resulting in less custard. I also had less cocoa in the pastry which was also rolled out much thicker (about 2-3mm) so while they were OK, I figured I could do better. The next effort made 16 tarts in a couple of cupcake tins, though I could probably have gotten 18 out of the dough if it hadn't been so warm in the kitchen (the dough got way too squishy to work with). Always position the slightly munty ones out the back there. Put the flour, cocoa, sugar and salt into a blender. Blend in the chilled butter until it resembles coarse breadcrumbs. Add the water 1tbsp at a time while still blending. Continue to blend until the dough starts to ball up. Turn out onto some plastic wrap, squish into a thick disk, cover fully and refrigerate for an hour before use. Roll the pastry out until quite thin - about 1mm or so. Use some flour (sparingly) to stop it sticking. 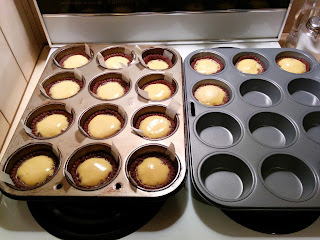 Cut circles that are about 1cm larger than the cupcake cup top. Cut out lengths of 1cm wide baking paper that fit in the tray holes with bits poking up - these will be handles to help pull the tarts out if they stick (which can happen with sloshed custard). Carefully poke the circles into the holes, being sure to not create a fold. Press into the corners. If you need to press the pastry around a bunch then it's a good idea to use a cast off piece of dough rolled into a ball to push the pastry around with. This will prevent you warming up the case pastry too much when fiddling with it, or poking holes with your finger tips. Cover with plastic wrap and chill for about 20 minutes. Preheat the oven to 200°C. Jab the case bases with a fork a couple of times, cover with a little bit of foil (carefully - I find it's easy to accidentally push the pastry sides down) and some baking weights. Bake for 10 minutes and then remove the foil to bake a further 10 minutes (after starting the second bake, prepare step 4). If your oven is as uneven as mine that's a good opportunity to turn the tray around to even out the bake a little. It can be tricky to tell if the pastry is done because it's so dark, but that cooking time should be about right. Reduce oven to 180°C. Mix the slightly warmed milk, caster sugar, vanilla and eggs. Skim off any bubbles and floating egg white chunks. 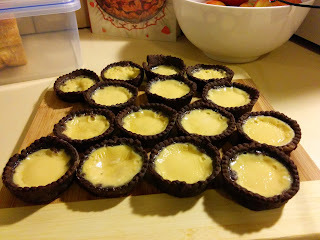 Once the pastry comes out of the blind baking, carefully pour the custard into the cases up to the rim. Sprinkle with the nutmeg. Bake for 20 minutes or until the custard doesn't wobble too alarmingly. Cool the tarts in the tin for about 5 minutes and then cool on a wire rack. Next time I'll tweak the recipe by adding just a little more sugar to the crust. Maybe another 20-30 grams. I seem to recall reading somewhere that a 1:2 ratio of cocoa to sugar is good to aim for, but I might be making that up.